When the front key bushings get worn, the resulting wobble can be very off-putting for pianists (a bit like too much play on a car steering wheel). Turning the bat pins can delay replacing the bushings by as much as several years, so it’s worth doing, especially as part of other operations (like easing the pilot holes, cleaning the key frame, levelling the keys). 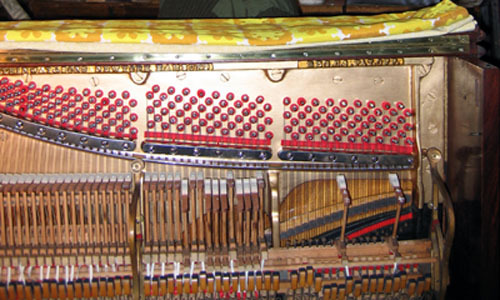 Caution is needed, of course, to not make the pins run too tight on the bushings – otherwise keys may start sticking as humidity changes. This entry was posted in Technical and tagged Turning Bat Pins. Bookmark the permalink.